Since I didn’t visit any rock art this weekend for a change, I’m going to post a photo of this large bear found near Moab since I did drive by it yesterday on my way home. 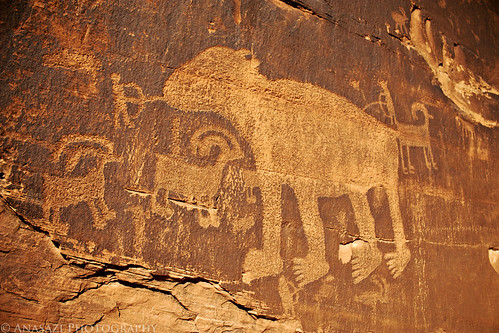 This is a well known petroglyph panel found near Moab along the Potash Road. The large bear appears to be a newer addition to this panel than the other figures and is actually superimposed over a few of them.